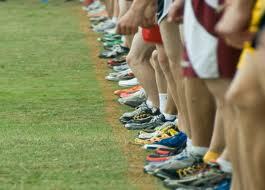 It’s about that time again – Cleveland Marathon weekend! A couple of years ago, I ran my first (possibly last, but not ruling it out just yet) half-marathon. 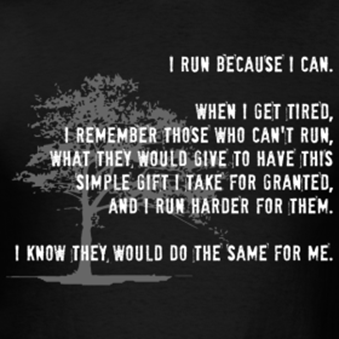 Let me preface this by saying – I am not a runner, I repeat, I am not a runner. I was always an athlete, but long distance was never really my thing. My friend Jenn convinced me to train for the Cleveland Half Marathon. So we turned to our pal, Hal Higdon, for some running advice. He offers training programs from 5ks to full marathons – for all levels of runners. Being the novice that I was, I went with this 12-week training program. So, back to the fact of not being a runner…I knew from the start I had to be extremely disciplined and follow this training program down to the day if I wanted to make it to 13.1. Before I even started the 12 training program I was already struggling, heading to the gym every day after work – trying to work my way up to 3 miles, no stopping. I was finally there, but motivation was already fading fast and the official training hadn’t even begun. After doing some research and poking around on the Cleveland Marathon website, I realized there were so many great charities out there that people were running in honor of. What better than to run for my baby cousin who was recently diagnosed with Rett Syndrome? I contacted the friendly team at the Cleveland Marathon – who reached out to Sean and Col to get Claire’s Crusade all set up as a charity partner. I will say at this point – I was so excited, I had a REAL reason to run. Now not only did I have a real reason to keep on going, but so did many others. First to jump on board was my fave guy out there – my dad. I was begging him to join me (and let’s be real, I needed someone else who was a novice, because my friend Jenn was smoking me when we were training together). Once he heard about Claire’s Crusade becoming a partner of the marathon, there was no more convincing him. We began building our team of crusaders and were well on our way to running 13.1 and rallying the whole time for Claire. The training was done and race day was finally here. The day was definitely a mix of emotions – excited to run my first half, pumped to do it rocking my Claire’s Crusade shirt, proud that we had a team of over 50 crusaders, a lot of pain when my legs didn’t want to go any further, motivated when I saw other crusaders out there running and cheering us along, a little embarrassed when my dad left me in the dust (remember when I said I wanted him to train because Jenn was smoking me, yeah – fail) and many, many more emotions. Whenever I felt like giving up and walking I thought about why I was doing this, for Claire. 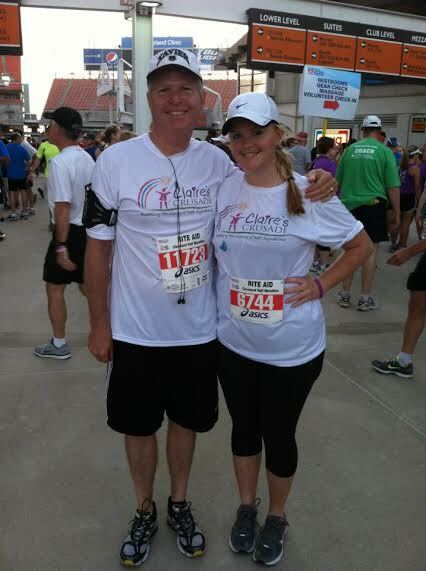 Claire won’t be able to run a half – and for that reason, I kept going. Crossing that finish line was especially emotional. It must have been physically obvious I was losing steam in the last mile or so. Colleen jumped in to finish that last mile with me – Col, I still owe you one for that. It was awesome. 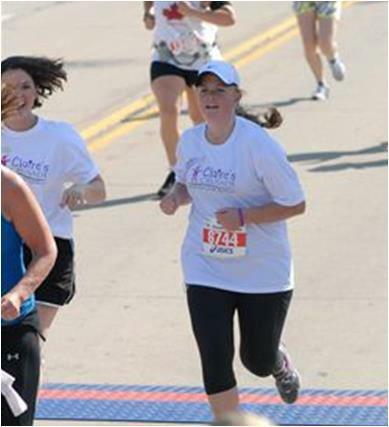 Year two of Claire’s Crusade being partnered with the Cleveland Marathon was another success – we went from 50 participants to over 150! We had one of the largest showings for charities involved with the marathon – how awesome is that!? This weekend, Claire’s Crusade will be represented by runners/ walkers/cheerers and new this year volunteers at the first water stop of the race. All 18,000 runners will pass our stop – so wear those Claire’s Crusade shirts proudly so we can cheer extra loud for you. So, after all of that – I will again reiterate that I am not a runner – but I did it! Good luck to all of the runners and walkers participating this weekend – I’ll be at the water stop, so let me know if you prefer water or Powerade 😉 And remember… when you start to lose steam and don’t think you can go much farther, just think of that little blue-eyed, curly, blonde haired beauty – I’m sure that little smile will give you all the motivation you need! It sure did for me. – Written by Lauren Bolmeyer, cousin of Colleen & Sean. This entry was posted in Uncategorized by Meet Claire. Bookmark the permalink. 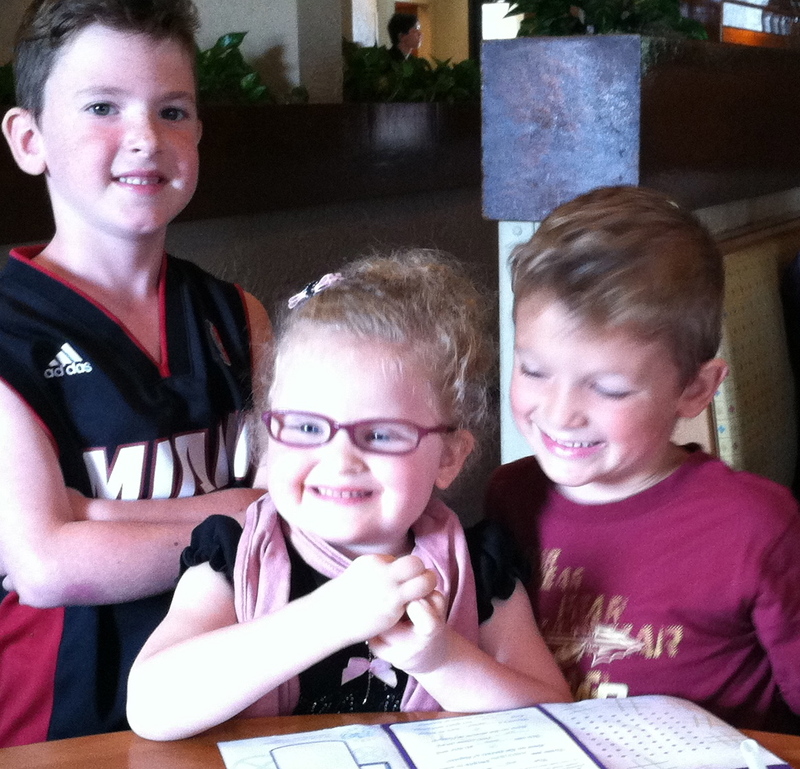 Dear Sean and Colleen…we have just come from today’s Race for Rett’s. We are Dwight and Angie Wheeler, Marissa’s “Grammy and Papa”. We are so sorry we didn’t get to see your beautiful little Claire. From the photos, she looks so adorable! I have read some of your blogs, Colleen, and it is so apparent the love and devotion you and Sean have for her and your two boys. By the way, one of your sons, (not sure which one) asked if he could have one of the signs I made and I was so glad to give it to him. I looked around for the other one so he could give it to his brother, but couldn’t find it…my hubby had already put it back in the car, but I didn’t know it. So sorry. As Marissa’s grandmother, I have cried buckets of tears, and have questioned in the past, “Why, Lord?” I no longer do either. Instead, I spend that time in prayer, and know that God has a plan for everything. My husband and I are devout Catholics, attending daily mass and Eucharistic Devotion and Adoration. The power of prayer is so vital to our lives. Our “Rissa”, is such a blessing and a special gift from Him, and we thank Him for her always. We will include your little gift from Him also in our prayer list as well as your whole family. Thank you and Sean for all that you do to further “the cause” for awareness, and helping to find a cure. Back when Marissa was diagnosed, 18 and a half years ago, Rett Syndrome was practically unheard of to most people. Progress is being made though, and we are never to lose hope. So God’s Blessings to you and your family, and may He grace you with His peace always. Just to let you know, Marissa is doing fine, had a little asthma going on from breathing in the cold air, and the run. The EMT’s came, administered a breathing treatment and all was well. Thank you so much for your concern! So glad that Marissa is doing fine. It was a privilege to meet her, and your whole family. Thank you so much for coming!